I wanted to make roasted chicken but was not really up for the carving bit, so I got some chicken legs instead. 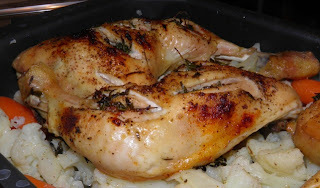 I was debating at the supermarket whether to make roasted chicken legs with rosemary or thyme. Then the problem solved itself as there was no fresh rosemary, so thyme it is! From experience, I know that thyme and lemon are always great with chicken. To give the chicken a little kick, I added some crushed garlic and cayenne pepper too as an experiment - who knows, it was really good! The chicken legs were so flavorful and juicy, so I simply served them with some steamed carrots and cauliflowers - I tossed the steamed vegetables in the meat juice, and then sprinkle them with some freshly grounded four seasons pepper. 1. In a small bowl, mix together the garlic, thyme leaves, lemon juice, olive oil, and some salt and pepper. Set aside. 2. Pat dry the chicken legs and slit them. Rub the thyme mixture into the chicken - be sure to rub some herbs into the slits. Let them marinate for at least an hour. 3. Heat the oven to 200 degree C.
4. Throw the sprigs of thyme into the casserole dish, and then lay the chicken legs on them. Sprinkle the chicken legs with some cayenne pepper. Bake in the oven for about 50 to 60 minutes, or until golden brown.